Scotland’s premier urban combat simulation arenas, for tactical team games. The U.S Military refer to it as MOUT (Military Operations on Urban Terrain) or UO (Urban Operations), whilst the British Military call it FIBUA (Fighting in Built-Up Areas). At Cambuslang we supply Cammo Suits and Bush Hats, otherwise you just need to dress for the weather. Please wear trainers or boots, no sandals or heels! Unlike paintball you don’t need to wear masks, gloves or ammo belts. Dundee is indoors but the arena is unheated so please dress appropriately. Combat City has been built to provide a safe and fun experience. The main playing surface at Cambuslang is artificial turf, so there are no tree roots, bogs or streams to worry about. The equipment uses Infra-Red technology, which is a safe invisible light. There are no projectiles like paintball to cause bruises. Our Combat Referees monitor each mission to ensure all rules of engagement are followed. Watch out for steps, and low entrances – no running! What are the age requirements for the combat arena? Participants aged 7 to 13 years must be accompanied by an adult (one adult can take responsibility for multiple kids). Participants aged 14 to 16 years old must be registered by an adult, but can stay and play without adult supervision. 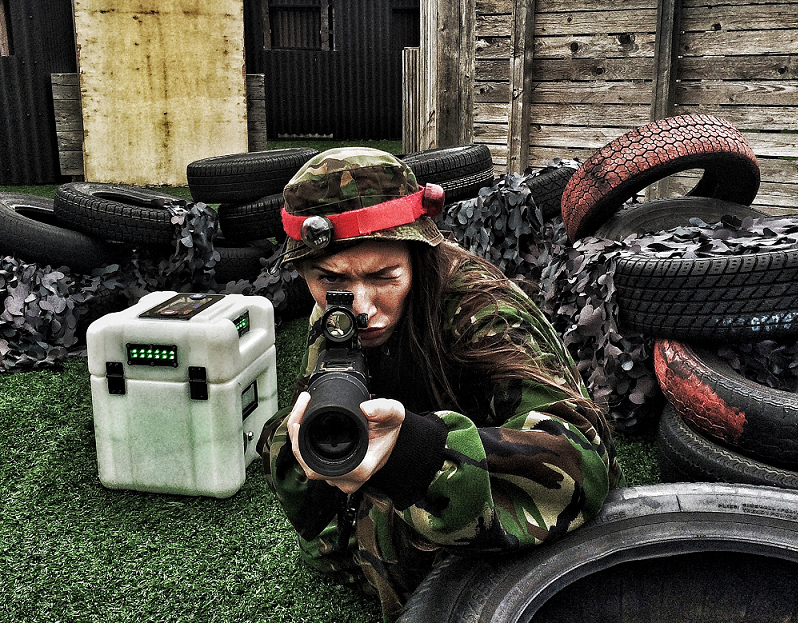 What is the difference between Combat City and Laser Tag in Glasgow and Dundee? Combat City is a military simulation, using a variety of realistic weapons to complete military objectives. The weapons can have different rates of fire, and cause different amounts of damage. Health points and Ammo can be limited, and Medic Boxes, Ammo Boxes and Respawn Boxes all allow a variety of Mission based games to be run. The battlezone is a large devastated urban area, which looks like the real thing. In laser tag all the weapons are the same, and players are immortal, encouraging a different style of combat, orientated to individual glory, rather than team achievement. A good arena like Lazer Planet in Clydebank has a Sci-Fi space theme, with a darklight maze, smoke and atmospheric music. Great fun, and a real blast to play, but completely different from the realism of Combat City. What is the difference between Combat City and Paintball in Glasgow and Dundee? It’s all about the benefits of sophisticated technology; the adrenalin rush is the same! Combat City weapons fire further, faster, and are more accurate. Even better by firing Infra-red light there are no projectiles to cause welts on your body, or cost you money every time you fire. There is no cheating at Combat City, however many referees a paintball field has it’s still easy to wipe off a hit. There is no physical contact so young kids can play well alongside adults, as they understand the missions and gun capabilities from playing games like Call Of Duty. However at weekends the morning session is normally reserved for ages 7 to 12, and the lunch time one on Saturdays for Stag/Hen parties. The other sessions are all Open Play, unless you make an exclusive booking for 30 players at peak time, or 10 players off-peak. The Cambuslang arena is available 7 days a week from 10am to 10pm (it’s floodlit at night), but all games must be pre-booked. The Booking Office is open 7 days a week from 10am to 7pm, and can be reached on 0141 641 0222. The Dundee arena is open Sat/Sun 10am -10pm, Mon 12 – 10pm, Tues Closed, Weds/Thurs 3pm – 10pm. Friday 12-10pm. During School Holidays we are open 7 days. Combat City in Cambuslang, Glasgow is an outdoor all-weather game. The arena is really well drained so there should be no standing water, and there are lots of sheltered parts of the arena. Keen players really like it when it’s damp, as you can then slide across the artificial turf. There is a large covered viewing shelter for spectators, and reception/briefing area. In exceptionally wet weather, or in icy conditions games might have to be cancelled or rescheduled. The Dundee centre is indoors, part of the ScotKart Indoor Karting Arena. The pizzeria in Scotkart serves a selection of freshly baked pizza, plus Italian coffee, soft drinks, cakes and snacks. Party food and buffets can be pre-booked and served in the Combat City Mess Hall. Any ‘Top Tips’ for Combat City? Keep moving from bunker to bunker to confuse your opponents about your location. Use the bunkers for cover, and only be in the open when moving between them. Practice ‘Snap Shooting’ where you pop out of your bunker, fire, and take cover again quickly. Plenty of private parking, Café, Vending machines, Lockers, Club House, Viewing terrace, Indoor Kart Track. There are no showers at the moment.